Solvents are used pervasively throughout the synthesis of chemical reagents and for chromatographic sample preparation. They are often employed as precursors to inert materials and active ingredients, and are used to concentrate and purify samples throughout production and quality control. The ubiquitous use of solvents in chemical synthesizing and sample preparation requires samples to be prepared in evaporators equipped to dry-off solvents and improve the concentration of manufactured compounds. However, the evaporation process can cause a significant workflow bottleneck to remove undesirable solvents for quality control analysis or reconstitution for product formulation. Reducing the disruptive capacity of solvent drying-off processes is critical for laboratory applications, particularly for high-throughput laboratories. Conventional evaporator components such as fume hoods and centrifugal evaporators are often used in these instances, but the nitrogen blow-down method is often preferable for high-throughput evaporation for well plates and test vials. The nitrogen blow-down method introduces heated nitrogen into a test vial or a microplate to compensate for the latent heat of solvent evaporation, which accelerates the evaporation process. This technique is suitable for improving the sample concentration of liquid analytes or providing absolute dryness for chemical compounds, and can be used at multiple stages throughout reagent synthesizing. Evaporators designed to perform nitrogen blow-down are routinely used to remove unwanted solvents from samples prior to resuspension for quality control analysis, or for reconstituting suitable compounds. Nitrogen blow-down is particularly suited for evaporating solvents with low boiling points, which are regularly used in chromatographic chemical analysis. This method directly introduces nitrogen gas into distinct well plates through sanitized stainless-steel injectors, improving evaporation uniformity for multiple compounds in a well plate. Evaporators equipped to perform nitrogen blow-down typically provide faster solvent evaporation results than alternative methods, improving experiment speed and precision to optimize laboratory throughput. 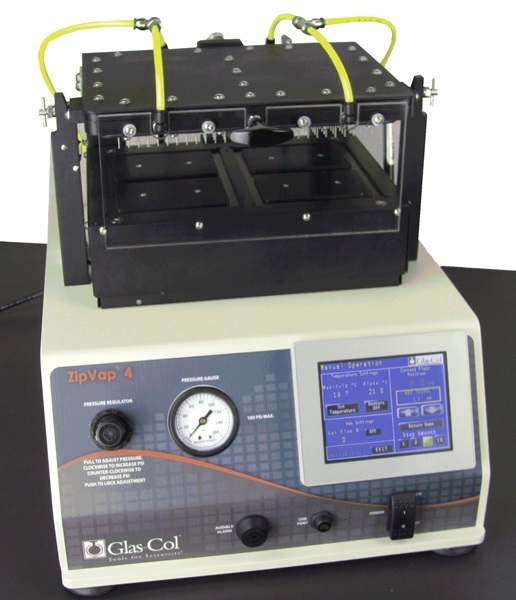 Glas-Col supplies a range of evaporators suitable for solvent drying-off, but our proprietary nitrogen blow-down instrument for high throughput environments is the ZipVap4. This advanced evaporator is equipped to perform evaporation processes for up to four 96-well plates simultaneously, reducing the established bottleneck for solvent evaporation in chemical synthesis. This intuitive system can store up to fifteen ten-step recipes with a built-in pressure regulator and pressure gauge to regulate the evaporation conditions of solvents such as methanol or chloroform. Glas-Col supplies a broad range of laboratory instruments for low, medium, and high throughput environments. Our established range of evaporators includes basic non-heated drying off systems, advanced systems that combine heating and mixing processes, and high throughput blow-down evaporators such as the distinguished ZipVap4. If you would like any more information about our range of evaporators, please do not hesitate to contact us.